If you read my review last year on the Nixplay Iris frame, it was obvious I was a big fan of the digital picture frame. In a nutshell, the Nixplay has WiFi connectivity, which displays cell phone images you or anyone remotely send to the frame. Along with the accompanying Nixplay app you can have the frame at your parents house on one end of the country and send images, which are instantly appear on the high resolution display from the other end. Now Nixplay has launched the Seed Wave Wi-Fi cloud frame, which incorporates many of the same features as last year’s model but adds the ability to add audio and/or music to the digital images or videos. To make this all come together, the free-standing 13-inch widescreen Seed Wave adds a bigger screen (up from 8-inches) and Bluetooth speakers. The Seed Wave has a display resolution of 1920 x 1080 with an aspect ratio of 16:9. The pair of premium 5-watt Bluetooth speakers are built into the back of the frame for a complete multimedia experience to watch the remote loaded content and give you a room filling sound. You can also use the speakers as just speakers for listening to a paired smartphone or tablet. 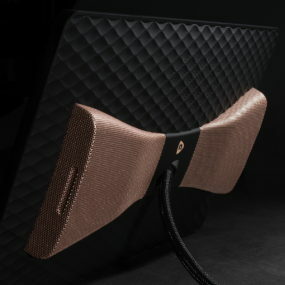 Inside is a dedicated bass and audio amplifier to make the sound experience optimum. Setting up the frame takes just minutes with your own Wi-Fi and a secure account login. You get 10GB of free cloud storage for the digital files, along with 8GB internal memory storage. Once the account and frame is set up, it’s up to you if you want to share the login information and invite others to stock up the frame. A sensor inside the frame allows it to turn on and off when it senses someone is nearby or everyone has left the room. A rubber stand keeps the frame in place. Social media albums can be connected for display from Facebook, Dropbox, Google Photos, Instagram and Verizon Cloud. As easily as you can upload to the frame, when you tire of seeing the same videos or images they can be deleted from the frame or remotely through the app. 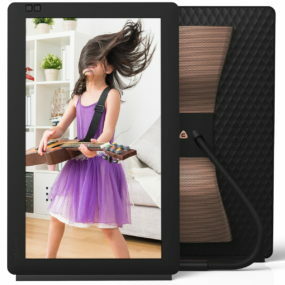 The frame has an attractive design with a matte black finish and AC power connection. The Seed Wave also works with Amazon Alexa. A remote is great for manually controlling the frame. The Nixplay mobile app is available for iOS and Android. Currently video is only supported with iOS and limited to 15 second videos. For the past few months I’ve been giving the new Kindle Paperwhite (10th generation) a test drive and since I can’t seem to put it down, I’d certainly say I’m a big fan of the dedicated e-reader. 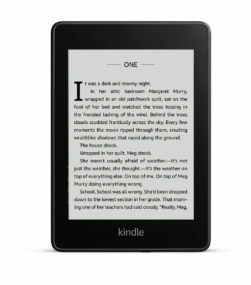 The tablet is touted as the thinnest, lightest Kindle Paperwhite. It has a flush-front design and 300 ppi glare-free display that reads like real paper even in bright sunlight. The reading display is 6 iinches and the overall size of the tablet is just a bit more. It’s much smaller and lighter than any other tablet I’ve used and when paired with the case it opens and reads just like a traditional book. I totally loved that this tablet does not have apps to play games, watch videos or read social media. It’s just for distraction-free reading. And is certainly ideal if you are looking for an e-reader for a student to increase they’re reading time without being able to switch to distracting apps. The tablet does have an “experimental” browser for the web, which I really stayed away from, because I enjoy the reading exclusivity. The screen is super easy to read with little glare and I could change the size of the font easily. 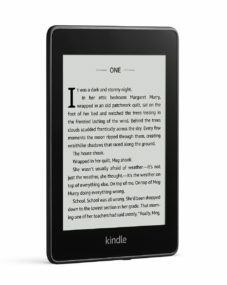 The Kindle Paperwhite is waterproof making it summer ready to read and relax at the beach, by the pool, or in the bath. It’s built with Audible integration so you can pair it with Bluetooth headphones or speakers to listen to your story if you like audiobooks. You can choose from 8-32 GB of internal storage to hold your books, magazines, comics, and audiobooks. I’m an avid reader and like that I can store more books for reading for when I don’t have Wi-Fi access. Typically, I read books from my local library and from Amazon Prime since those are options for me. The Kindle works seamlessly with Kindle unlimited (subscription required), and you can often check out e-books from your local library to read on the Kindle. I read two books on it to test it. One from my library and one from Amazon Prime and both were easy to download, open and read. A single battery charge lasted weeks and the built-in adjustable light lets me read indoors and outdoors, day and night. I also like how the case wakes up the tablet when opened and puts it to sleep when its closed to help save battery power.